Here’s my confession: I have a HUGE crush on this book. In fact, I’ll tell you what happy looks like – my face when I’m reading Jennifer E. Smith’s sweet, funny, and cleverly written exchanges between Graham Larkin and Ellie O’Neill. In this story, a simple mistake in typing an e-mail address leads to a correspondence between two teenagers from opposite sides of the country. The teenagers don’t know much of anything about each other, and yet it’s that anonymity through e-mail with a stranger that allows them to open up to each other about things they’d never tell anyone they actually knew. What results is a conversation of thoughts and feelings in the moment – things they can’t say out loud but can say to each other. This ranges from seemingly insignificant observations about the annoyingness of smiley faces used in e-mails (J) to the soul-searching question of what happiness looks like. Each still holds an important secret, though. Graham Larkin is a teen heartthrob movie star, trapped in a world of paparazzi and feeling like nobody really wants to be around him for him, but only for his looks and his fame. In his correspondence with Ellie, he gets to be himself and get to know her without the trappings of fame. He’s just a witty, smart, normal guy who’s falling for a girl he’s never met. Ellie O’Neill is a seemingly typical small town girl, but she and her mom have changed their names to keep a scandalous past hidden. Ellie is the only child of a single mom, and life gets lonely even with her friends to keep her company. This anonymous pen pal deal is exactly what she needs – a guy she can be honest with and dream about. Only, what if it doesn’t have to be a dream anymore? When Ellie lets her town’s name slip, Graham starts pulling strings and gets the location for his next movie shoot changed… to Ellie’s small coastal town. Sounds like every girl’s dream – what teenage girl doesn’t want the teen magazine centerfold showing up on her doorstep, ready to sweep her off her feet? For Ellie, though, Graham’s fame and constant media attention complicate and change everything. Watching these two characters navigate the challenges they each face as they explore the possibilities the future holds is great summer fun. The characters are great to spend some time with, the writing is full of smart romance and beautiful description, and the story holds enough excitement to keep us all daydreaming about our teenaged selves opening the door to find our adolescent celebrity man-crush there, declaring his love for us. 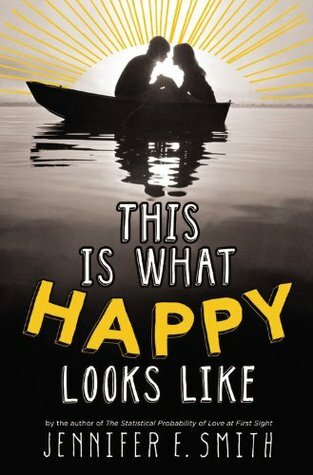 All in all, I highly recommend you check out This Is What Happy Looks Like… and soon! 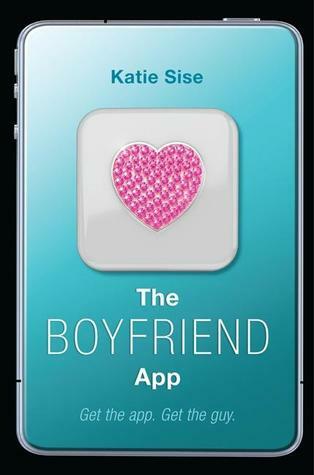 So last night I stayed up really late and read The Boyfriend App by Katie Sise. I probably should have slept some more considering the fact that I had to teach today, but an intriguing premise, quirky protagonist, and swoon-worthy boy had me hooked. There was no chance I was going to sleep until I finished. In The Boyfriend App, protagonist Audrey McCarthy is a former popular girl who’s now all techie and geeky in a way that makes you root for her to gain her self-confidence back. She’s also getting bullied by her old popular best friend, trying to figure out a way to pay for college, and still mourning the death of her father, all of which further make you want to see her succeed. So when an app building contest is announced, with the winner receiving a $200,000 scholarship to a college of their choice as a prize, Audrey is ALL over it. She’s a super talented hacker and code-writer, and comes up with the perfect idea: an app that helps you find a match and alerts you when you’re around them. It’s cool. It takes off quickly and gets her in the running for the scholarship… until it backfires. After an accident that leads to her discovering a huge secret contained within the buyPhones sold to teenagers, she works furiously to release The Boyfriend App 2.0, which is successful. Too successful. As I read, I was definitely captivated by the storyline, which was actually pretty exciting. I will state up front that I had a few problems with the book. One, the whole buyPhone thing is clearly actually as iPhone. I have a strange irritation with things that aren’t just outright NAMED what they obviously ARE. As Public ends up being painted in a negative light, I understand why they wouldn’t just call it Apple in the book, but that doesn’t make it any less annoying every time I have to read “buyPhone” and all the other “buy” things. Also, as much as every girl would like the power to make guys instantly desire her and kiss her, that doesn’t really make it morally correct. So that was an issue for me… though still enjoyable. Weird. Overall, this was fun and unusual and intriguing. I recommend it (high school and up). Enjoy! So I’m really excited about my new role as the YA Reviewer for shereads.org, a website that reaches a huge audience of women passionate about reading books. I get to introduce some of my favorites, new and old, to the women of She Reads to get them into the world of young adult fiction, which has an ever-growing audience of grown adult readers. Check out my “The Teacher Recommends” posts on She Reads! Also, if you’re an author or publisher interested in having a book considered for review on She Reads, just contact me through twitter or through the blog.